Llanddwyn Beach01286 672232work BeachAn excellent, sandy beach backed by forest and extensive dunes at the south-western tip of Anglesey. 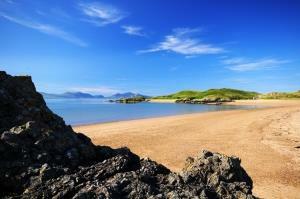 Llanddwyn Island is located at the far end of this pleasant beach near Newborough Warren. This narrow finger of land is an ideal picnic site during fine weather, but also an exhilarating place when the winter winds blow. Its rolling dunes, large rock outcrops and mixture of historic buildings makes it an ideal place for an afternoon of exploration. Llanddwyn is not quite an island as it remains attached to the mainland at all but the highest tides. It provides excellent views of Snowdonia and the Llyn Peninsula and is part of the Newborough Warren National Nature Reserve. A path leads to the nature reserve at Llanddwyn Island and the nearby forest has great footpaths. An excellent, sandy beach backed by forest and extensive dunes at the south-western tip of Anglesey. Llanddwyn Island is located at the far end of this pleasant beach near Newborough Warren. This narrow finger of land is an ideal picnic site during fine weather, but also an exhilarating place when the winter winds blow. Its rolling dunes, large rock outcrops and mixture of historic buildings makes it an ideal place for an afternoon of exploration. Llanddwyn is not quite an island as it remains attached to the mainland at all but the highest tides. It provides excellent views of Snowdonia and the Llyn Peninsula and is part of the Newborough Warren National Nature Reserve. A path leads to the nature reserve at Llanddwyn Island and the nearby forest has great footpaths. Blue Flag & Seaside Award beach. Dog restrictions apply between May and end September. A55 Junction 8A (signed A5 Llanfair) and then A4080 to Newborough. Turn left into the village where signed for car park (just before the junction with the B4421) and continue past the car park (signed for Llanddwyn car park). Follow this road until you reach a barrier (where you pay the parking charge) and then follow the road down to the beach car park.